hide in daylight and open only to the night. To which you, your majesty, hearken. **I actually got up and out early enough this brisk morn to capture a moonflower before the light caused it to close completely and perish. As you can see, her edges have started to wrinkle however. Moonflowers are in the same family as morning glories, and you can see a few blue ones over and behind it starting to unfurl as the “moonie” closes. This entry was posted in Notes and tagged Blossoms, Blue, Bud, Confined, Daylight, Fingers, Garden, Heavens, Language, Midnight, Mimics, Moon, Moonflower, Mysterious, Night, Sacred, Secrets, Stars, Trellis, Veil, Vine. Bookmark the permalink. How glorious. 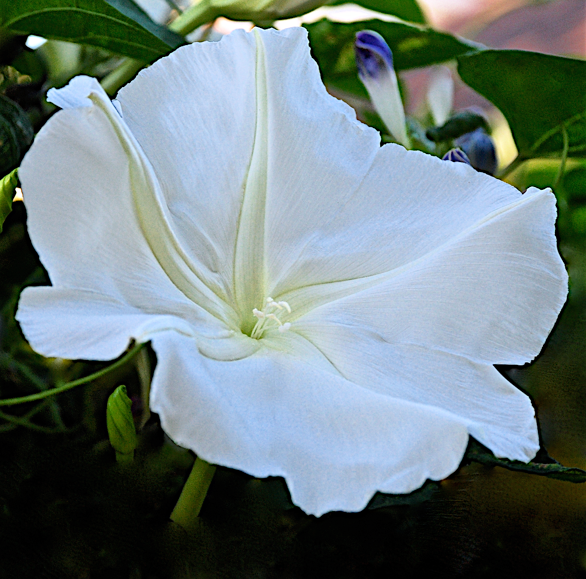 I may try the Moon flowers with morning glories next year. Wonderful words to cherish your moonflower. I’ve never seen one in person. They sounds like a mysterious plant! Thanks Natalie! Oh lovely Natalie. You are a poet. And such a nice flower. As always LMS, lovely words and pics. Your beautiful words are so fitting for this flower. I have grown moon. I have grown these before. I should grow them again. I lost my internet connection while posting my comment, and ended up making a mess out of it. Sorry.